Many of you have probably seen these by now – either through your fashionista friend, or in the ad pages of Native People’s Magazine, or on the desk of your professor or boss. 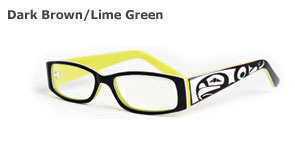 These are Aya eye glasses, specially designed by world renowned First Nations artist Corrine Hunt. Hailing from Alert Bay in British Columbia, Hunt has been creating contemporary art that reflects the themes and traditions of her First Nations Kwakiutl and Tlingit heritage for over 2 decades. She even co-designed the Vancouver 2010 Olympic Medals. A couple of years ago, her designs were added to sunglasses and readers, and now optical glasses, which themselves were designed by Carla D’Angelo, founder of AYA Eyewear. 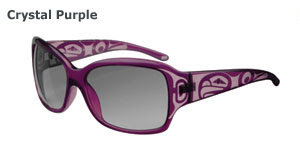 Hunt’s artwork etched on the side arms of the eyewear frames incorporate contemporary, nature-inspired designs including the sun, hummingbird, raven, orca, eagle and wolf. Aside from the beautiful art along the sides of the glasses, partial proceeds from the sale of AYA Eyewear support ONEXONE First Nations nutritious breakfast programs. Top sellers for the Aya Readers include the Salma ($39) and the Esme ($60) styles. The Salma design is lasered so that elements of the design are either a rich color or clear crystal, which allows for dramatic contrast for this eagle design. Salma is available in burgundy, black, red (shown), and brown/blue. The eagle is a symbol of power and intelligence. Each pair of Esme readers is individually made, and the laminate zyl material and colors are customized so that the First Nations artwork stands out. The eagle design on the temples is paired with solid colored fronts so the end look, while making a strong statement, is wearable day-to-day. Top sellers for the Aya Sunglasses include the Althea ($35) and the Yasmine ($35) styles. The Althea design is lasered so that elements of the design are either a rich color or clear crystal. Althea features a unique eagle design and comes in a lustrous black, dramatic purple (shown), rich red or soft brown. 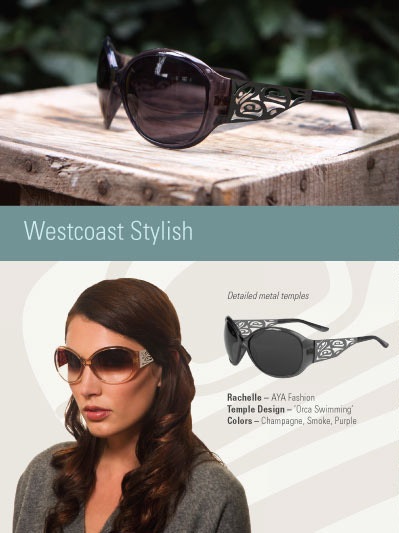 The Yasmine shades are mid-sized ladies’ sunglasses and feature a bold eagle design. They are double polished for a lustrous finish and are available in crystal red (shown), crystal grey, black and a unique brown over blue. And finally, top sellers for the Aya Opticals include the Ashley ($169) and the Sisley ($169) styles. Made from Acetate and Stainless Steel, the Ashley optical glasses feature a cut-out Raven design in Black/Crystal, Red, Green, and Brown (shown). The raven is a symbol of the power of the unknown. The raven is a bringer of light to the world, and is cunning and boisterous. The Sisley glasses feature an etched Orca design. The Orca is a symbol of good and represents the traveler and guardian. These opticals can be purchased in Brown/Blue (shown), Black/White, or Red/Cream. Every pair of optical frames comes with an embossed hard case and microfibre cleaning cloth, and 1 year warranty. Click here and here to check out the Aya Optical website. Is it possible to order teh readers on line? Saw the ad in the NMAI magazine and love the glasses!